It’s always hard to say good-bye to someone. Especially the ultimate good-bye, and the loss of life and love. It’s even harder to move past that moment. I wouldn’t pretend to be wise enough to know the best way to do so, or even know a good way. But I will use this week to examine a show that tried to do that, with drama, gentle laughter, and sweet emotion. Cristina Raines broke viewers’ hearts as Kate Hayden, a single mother who developed osteogenic sarcoma, a cancer of the bone in her leg. Medical science being what it was in the early ’70s, and the progression of the disease also being rather significant, her choices were few: She could have the leg amputated, and hope that the cancer hadn’t spread; or attempt radical chemotherapy, perhaps eradicating the cancer, but with significant, life changing side effects (which also might affect her still nursing daughter). Ultimately, she chose neither, and instead lived her life as fully as she could for as long as she could. Her journey was documented with a series of tape recordings, left as a legacy for her daughter Jill, to hopefully give advice and whatever wisdom Kate could muster, and at least give Jill something to hang onto after Kate was gone. Amazingly, love found Kate during this otherwise painful time. A folk musician, Sam, (Cliff DeYoung) comes into her life, and although he wants to be her strength, and help her fight the circumstances fate has dealt her, he loves her and Jill enough to stand by them no matter what. And then the cancer is finally diagnosed, and it becomes the beginning of the end. Even though Sam makes mistakes, and has more than his share of troubles accepting what will ultimately happen, Sunshine is really as much a love story and a celebration of life as it is a journey towards its end. –Kate and Sam, as Sam proposes. The movie is as much about Sam’s acceptance and love of Kate as it is Kate’s acceptance of death. Sam is aggravated by the life he’ll have missed out on after Kate is gone, and Kate is at least content in the knowledge of the love that already exists. The TV-movie comes to a close with Kate’s death, and Sam left raising Jill, the part of Kate that still remains with him. The movie is a true tear-jerker in the best sense of the term, with outstanding performances by Raines, DeYoung, and Brenda Vaccaro as the doctor trying to convince Kate to try whatever it takes to survive, but ultimately accepting Kate’s decision to die with some sense of dignity, and helping Sam to understand that. Audiences responded in many ways, much as the different characters did: some with tears, some with understanding, and some with anger and loss. Sunshine did what all good drama does: it engaged your emotions and told a story about what life (and in this case, death) was all about. Two years after the airing of Sunshine, NBC decided to air a series in the Spring of 1975, also called Sunshine. Still set in Vancouver and continuing the story of the movie, it again starred Cliff DeYoung as Sam Hayden, with Elisabeth Cheshire as the now five-year-old Jill. It’s time for Sam to start learning to live again, to grow up himself and become a father, with the help of neighbor Nora (Meg Foster) and folk bandmates Corey and Weaver (Corey Fischer and Bill Mumy). Of course, this being the mid-70’s, the central theme of many of the episodes was the tug-of-war between the traditional mores of raising a child, especially on your own, and the free-spirited and open relationship that had developed in this very non-traditional family. Both Sam and Jill, with assistance from their friends, helped each other grow up, at least a little bit. Still a rather gentle series, with no laugh track (which was a welcome departure from most half-hour series at the time), Sunshine didn’t necessarily dwell on the depression of what had happened in the character’s past, but didn’t shy away from it either. Kate’s death was simply part of what had made Sam and Jill what they were, and they were both learning to live life as they dealt with the memories, both good and bad, of Kate and her recorded legacy. This was a very different way to frame a series, and while not maudlin in any way, it was still not the usual laugh-a-minute fare of most “comedies”. It had a more common tonality with shows such as Little House on the Prairie and The Waltons, yet was set in present day. Therefore, Sunshine dealt, most gently, with more modern issues of family, love, and life. And maybe it still hit a bit close to home for some because of the current time frame and the back story of the characters. It lasted 13 episodes, and the series was over. The story, however, wasn’t finished. Two years later, in 1977, NBC commissioned another TV-movie for the holiday season called Sunshine Christmas, with the entire cast returning. Friend (and surrogate mom) Nora is getting married, Sam’s turning 30, and he’s realizing he’s not really going to make it big as a musician. He still has the responsibility of raising a daughter, let alone making life-changing decisions about his own direction. He finally has to grow up, but he doesn’t really know how, even now. …who has realized the same thing about Sam, and has forced her grandparents to chase after him down the dusty Texas highway, to finally reunite the two of them. They know, beyond a shadow of a doubt, that whatever life will throw at them, be it loss, joy, or anything in between, they have to grow up together. Sunshine Christmas was very successful, and ran on NBC for a few years as a holiday special before fading away. 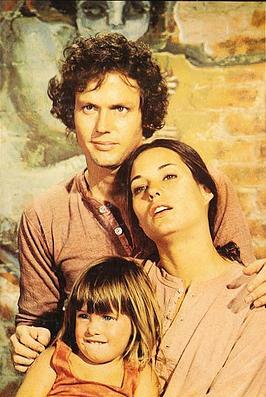 Both of the movies and the series featured the songs of John Denver (hence the title Sunshine, as in “Sunshine on my Shoulders”, Kate’s favorite song ), and music was featured heavily in many of the episodes, both as background and as part of the plot (Sam actually proposes to Kate in the original movie DURING his singing of “My Sweet Lady” in the hospital room!). In fact, DeYoung’s version of “My Sweet Lady” actually broke the Top 20 of the Billboard chart that year. Unfortunately, the extensive use of music, plus the fact that the original movie was on CBS and the subsequent series and Christmas movie were NBC properties have pretty much precluded any possible DVD release. Bootlegs of the movies are available, but if you don’t mind 13 parts, someone has put the original movie up on YouTube recently. Unfortunately, none of the series seems to exist, although if anyone has any leads, I’m sure listening. There were book versions of both Sunshine and Sunshine Christmas, AND a novelization of some of the TV episodes, written by Norma Klein. The original movie novelization was a perennial Young Adult best seller for many years, going into well over 20 printings. 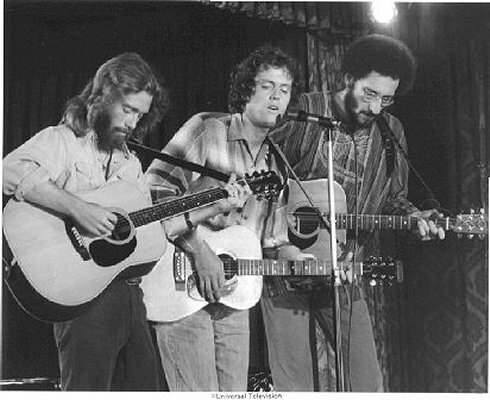 CLIFF DEYOUNG (Sam Hayden) was a legitimate singer long before Sunshine, playing with Jimi Hendrix, The Doors, and Janis Joplin, and had a starring turn on Broadway in the original production of the musical Hair. His lengthy career on television includes guest spots in series from the ’70’s to current shows, with memorable turns as Robert Kennedy in Kings and the crazed Doctor in the Robocop series. He still has an active schedule, recently appearing in Grey’s Anatomy and In Plain Sight. Sunshine was one of the first roles for CRISTINA RAINES (Kate Hayden), in a career that included regular stints on the mini-series Centennial and the series Flamingo Road. Numerous guest roles followed until 1991, when she retired from the acting business. She is married to writer/producer/director Christopher Crowe. ELISABETH CHESHIRE (Jill Hayden) had a reasonably busy career as a child actor, appearing in shows like Fantasy Island, Family, and Highway to Heaven. Her best known role is in the Oscar-winning movie Melvin and Howard, and she also appeared in the movie Looking for Mr. Goodbar. MEG FOSTER (Nora) and her exotic grey eyes have been found in many different productions, including portraying the original Chris Cagney in Cagney & Lacey. She’s also known as the villainess of the He-Man and the Masters of the Universe movie, and had memorable roles in Quantum Leap, Star Trek: DS9, and as Queen Hera in both the Hercules and Xena series. BILL MUMY (Weaver) was famous as a child, playing Will Robinson on Lost in Space, and also a frightening role as a child with overwhelming powers in a classic episode of The Twilight Zone. As an adult, he’s best known as Lennier on Babylon 5, and has an extensive voice-over career in animated shows, commercials, and as one of the narrators for A&E’s Biography series. He’s an accomplished musician as well, playing at least seven different instruments. COREY FISCHER (Corey) left television for the stage shortly after Sunshine Christmas, becoming an award-winning playwright and co-founding A Traveling Jewish Theatre, later finding a permanent home for himself and the theatre group in San Francisco. Although he still continues to appear on television occasionally, his writing has expanded to fiction as well as plays, and he continues to work with the ATJT group on a regular basis. I don’t need to add anything here. Those two simple statements are what it’s all about. Sunshine 2-hour TV movie: aired November 9, 1973 on CBS. Aired at Friday 8/7 Central? No. Its regular slot was Thursdays at 8/7 Central. 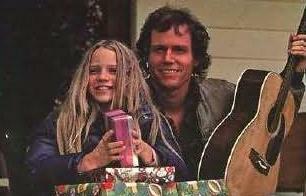 Sunshine Christmas: aired December 12, 1977 on NBC. Comments and suggestions welcomed as always.